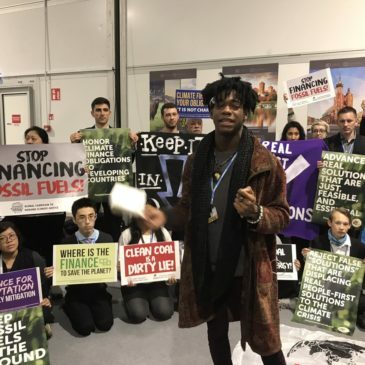 Something amazing happened Tuesday morning at the international climate talks known as COP24: As government delegates filed into the conference hall for the third day of the global climate talks they were confronted by people representing communities from all around the world demanding true climate justice. While you watch, consider chipping in to support 198 methods and our ongoing work to support direct actions that center the impacts of climate chaos like this at the COP talks. Later that day, our team also held an official an UNFCCC press conference to unveil the People’s Demands for Climate Justice. We called on all governments to put the People’s Demands at the heart of their climate negotiations and ensure that the roadmap for implementing the Paris Climate Accords delivers real, just solutions that put people first. We think that the People’s Demands — which more than 250,000 people including many thousands of 198 methods supports signed onto — are a great place to start. Together, we’ll make sure policymakers reject the dangerous schemes peddled by Big Polluters and the Trump administration. — Dipti Bhatnagar, Friends of the Earth International. “Through the climate crisis, our nature, land, and forests have become business opportunities for bankers and corporations. 1.5 or 2 degrees are mere dangling carrots. The ongoing negotiations and ministerial declarations are shifting the focus away from the pathways to real solutions. The lands, territories, and forests where indigenous people, communities, and women are in the front lines, vulnerable to climate shocks, but resilient enough to respond with their own actions, using their customary practices, traditional wisdom, and knowledge. However, our rights, governance, conservation and restorations practices are not recognized and supported, since they neither bring credits, nor profits. — Souparna Lahiri, Global Forest Coalition. I cannot Believe that Donations are the actual reason that puts anybody in the WH.!!!!!!!! Where Actually should be the Popular Votes to be used for that!!!! Therefore; Our first move has to be to eliminate the Statement that is getting spread around that says; “DEEP POCKET WINS”!!!!!!!!!!!!!!!!!!!! Which is why we are having so much PROBLEMS, SINCE THE “SELECTION” OF 2016!!!!!!!!!!!!!!!!!!!!!!!!!! We need to make sure that ALL DONATIONS gets deposited into a “ELECTION FUND”, then, it gets divided equally between the Parties, to use for their qualified Candidates!!!!!!! Then “DARK MONEY” will have no affect on ELECTION!!!!!! !